Justice Binta Nyako of the Federal High court sitting in Abuja, on Wednesday gave Senator Enyinaya Abaribe till June 26, 2018 to provide leader of proscribed Indigenous Peoples of Biafra (IPOB), Nnamdi Kanu in court or risk going to prison. The trial Judge adjourned till June 26, 2018 after the court ordered the prosecution to serve the sureties with an earlier order of court demanding them to appear in court and explain the whereabouts of Kanu or show cause why they should not forfeit their bail bond. 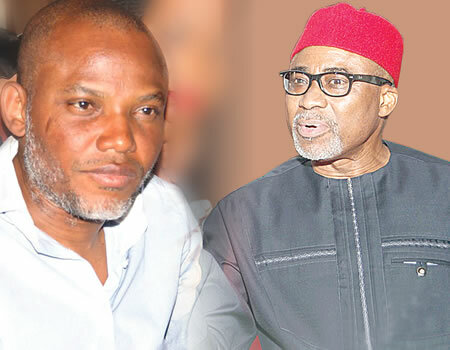 According to Tribune, Abaribe who is representing Abia South Senatorial District, Immanuel El-Shalom a Jewish Chief High Priest and a Chartered Accountant residing in Abuja, Mr Tochukwu Uchendu, had on April 28, entered an undertaken to produce Kanu before the court to face his trial, and deposited a whooping sum of N100 million each. When the matter was called yesterday, counsel to the sureties observed that the court order had not been served on their clients to enable them prepare for their defence. Counsel to Abaribe, Chukwuma Umeh (SAN), whose submission was adopted by others urged the court to direct that an enrol order be issued and served on his client by the prosecution. This, he submitted, was in the spirit of a fair hearing as enshrined in section 36 of the 1999 constitution. According to him, “I apply that a proper thing be done, that is for a summon to be issued and served on the sureties for them to show cause why their bail bond should not be forfeited. “The prosecution ought to have taken further steps to obtain an enrol order served on them. This is because a court order that is not served cannot be used against them as it is not binding on them until it is served on them," he said. Both Franklin Chude, who appeared for Tochukwu Uchendu, one of the sureties and Alloy Ejimakor, counsel to Emmanuel El-Shalom, aligned themselves with the submission of Umeh. However, Chude drew the court’s attention to an application he filed seeking the setting aside of the ruling of the court, adding that the prosecution counsel has not filed a counter affidavit to the application. Justice Nyako, however, observed that the said application referred to by Chude was not in the court’s file. Responding, prosecution counsel, Shuaibu Labaran urged the court to discountenance the submissions of the applicants and proceed with the business of the day, which he said was for the sureties to show cause why they should not forfeit their bail bond. It would be recalled that prosecution counsel, following the failure of Kanu to appear in court to face his trial, had in an application asked the court to order that the three sureties produce the first defendant or should be made to appear before the court on the next adjourned date to show cause why their bail bond should not be forfeited. Kanu who is the 1st defendant is facing four out of the five-count amended charge preferred against him and four others, whose trial has since been separated from that of Kanu. It will be recalled that Justice Nyako had in a ruling on April 25, released Kanu on bail after he had spent a year and seven months in detention, though the court okayed his co-defendants to remain in prison custody. Consequently, Abaribe and the two others had on April 28, entered an undertaken to produce Kanu before the court to face his trial, and deposited a whooping sum of N100m each. However, Kanu’s whereabouts have remained unknown after the military attacked his hometown in Abia State last year, a development that has placed his sureties at risk of being sent to prison or forfeiting their bail bond.